Will Biography be a Lost Art? As I flew into JFK last week, approaching over the suburbs of New York, I was reminded of my first sight of the USA way back then. The fact that every house had its own plot, separated from its neighbours by an alley with no terraced houses in sight struck me as an indicator of the space in America that hits me afresh every time I return. I was also amazed by the blue squares of personal swimming pools, such a rarity in the UK that it took me a while to work out what I was seeing. However, I certainly was feeling very uncertain about life, arriving with no cash in hand and that feeling of scale and space did nothing to make me feel at home. Laker is no more. I don’t think standby tickets are a ’thing’ any longer. And if I had turned up last week with a viola in hand – as I did then – as well as the rest of my luggage I suspect I would have been told it was outsize luggage and had to go in the hold; or that I had to buy another seat. Times have changed. Furthermore, the idea of only phoning parents once a year (because of the huge cost; the technology did exist) must be an alien idea to today’s postdocs with their ever present smartphones, at least if they have good parental relationships. The absence of easy access to the internet when crossing the Atlantic (or the American continent itself) can feel like real deprivation to some travellers, as is immediately apparently from the sound of all the phones pinging on as soon as the ‘fasten seat belts’ sign is turned off upon landing. People can’t wait to find out what their Twitter feed or email is telling them (although, sometimes, one would probably rather not know). But with all this electronic messaging what will future biographers do? When I landed in the USA and had finally managed to make my way to Ithaca and locate my husband (all complicated by the absence of ready cash; travellers’ cheques don’t work well for a phone requiring a mere dime; I had no credit card usuable in the USA, and my husband had no idea of which day I’d arrive since I’d flown standby) I settled down to write to my mother with my experiences. During the four years I was in the States I probably wrote to her a couple of times a week, proper hand-written letters. I likewise received letters back from my UK-based family. Sometimes the writing was more legible than others, sometimes the news – about progress or otherwise in electron microscopy and the state of my interactions with colleagues unknown to her – must have bored my non-scientist mother senseless, but it was the act of putting pen to paper and the contact when no other method was available that counted. When my mother died I found she had kept some – but only some – of these letters: there is a hefty bunch from 1980 when I was still at Cornell, plus some from considerably earlier around the time I went to university as an undergraduate, but the first letters I wrote upon arrival in the USA are gone. Hence I cannot quote from them to tell you accurately how acute the culture shock was, but I remember feeling it all too vividly. I certainly thought of it as ‘two nations divided by a common language’, words usually attributed to George Bernard Shaw. I have been told, by a well-known biographer of scientists, that there is a ‘dark period’ when neither letters nor emails exist that will challenge future biographers. The dates for this will be the 10-15 years around the turn of the century. Email existed, so letters drifted out of meaningful existence for a subsequent biographer’s fact-finding, but email correspondence was not archived. Those years will have no tangible record to tell us about the individual’s state of mind, their response either to big world events (9/11 perhaps) or to the trifling consequences of moving house or finding their feet in a new role or country. I suspect this may be less a problem for the political figures whose ‘papers’ Churchill College Archives tend to house, than of the currently un-noted scientists who become the Nobel prize-winners of the future whose records we might want to acquire. Nevertheless for the College Archivist I know the question of how best to preserve email records (those of more recent vintage that do still exist) is a vexed one. What will be available to future writers who want to tell the personal or professional narrative of the men and women of science, or those folk who lurk in Whitehall corridors, for future generations to contemplate? Because the past was so rich in tangible material, in the Archives we have many amazing artefacts from the life of Winston Churchill, such as his annotated speeches (including markings where to pause for maximum effect, or highlighting his changes as his rhetoric developed e.g. see here for a ready example; many of the papers can be studied on line in the Churchill online Archive). Or, for a different sort of politician, one can study Maggie Thatcher’s papers, also available online through the Thatcher Foundation. (The College even possesses some of her handbags. 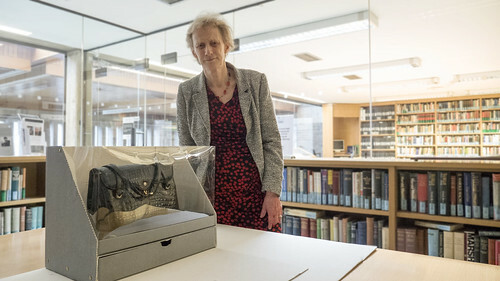 As the first female Master of the College I thought it only appropriate that I should have a look at one of these, but unfortunately – archivists being what they are – as is apparent in the photo at the top I wasn’t actually allowed to touch the still-boxed- up gift to her brought out for my delectation.) But, handbags aside, what ‘artefacts’ will we still have in the future? I am sure there are strict rules about maintaining the records of a member of the Cabinet, but for scientists who do everything at speed and by email, possibly influenced also in the future by the new GDPR legislation, what kind of illuminating insights will remain for the biographers of the future? The reality is the concreteness of hand-writing letters meant that the content was very different from the tossed off emails. I may have sent an email back to my family daily throughout my recent trip, but they were very different beasts from the letters I’d written to my mother. They merely recorded where I was and perhaps an outline of what I’d done and who I’d met. They did not discuss anything in detail of my thoughts on what I’d been getting up to. Email is such a different medium to a letter and we have lost the art. But the essence of American journalism is vulgarity divested of truth. Their best papers write for a class of snotty housemaids and footmen ….I think mind you that vulgarity is a sign of strength. A great, crude, strong young people are the Americans – like a boisterous healthy boy among enervated but well bred ladies and gentlemen. (These were captured in a letter to his brother.) What will be left for tomorrow’s biographers of our leaders to digest? This entry was posted in Communicating Science, Science Culture and tagged email, letters, Maggie Thatcher, New York, Winston Churchill. Bookmark the permalink. One Response to Will Biography be a Lost Art? It is interesting that you write this now as I was thinking along similar lines as I am writing the lives of two women scientists – one a physicist, who are both no more. I found a bunch of condolence letters written by friends, colleagues and family on her passing and even though these are in 2001 and 2002, they are still mostly hand written on paper, inlands, aerograms and sometimes even postcards. These are various forms of letter writing that was possible through the Indian postal service but sadly rarely used now. I was indeed wondering how one would find such details from email, FB posts and Tweets.